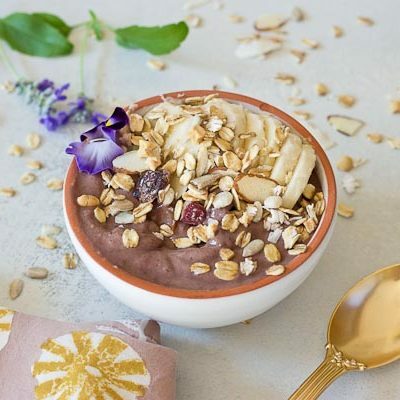 This Banana Peanut Butter Breakfast Bowl recipe post is sponsored by Bob’s Red Mill and Sambazon. 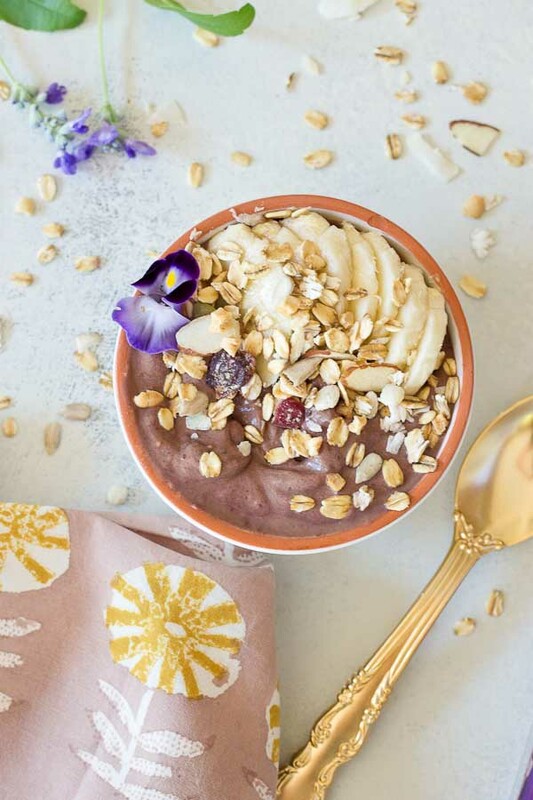 This Banana Peanut Butter Breakfast Bowl is seriously the best smoothie bowl ever. 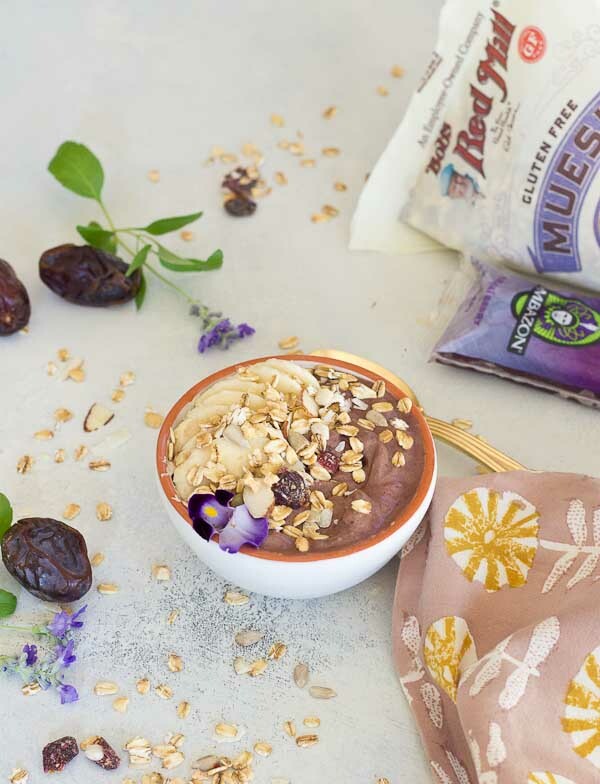 It’s naturally sweetened with medjool dates, bananas and power packed with antioxidants from unsweetened acai. 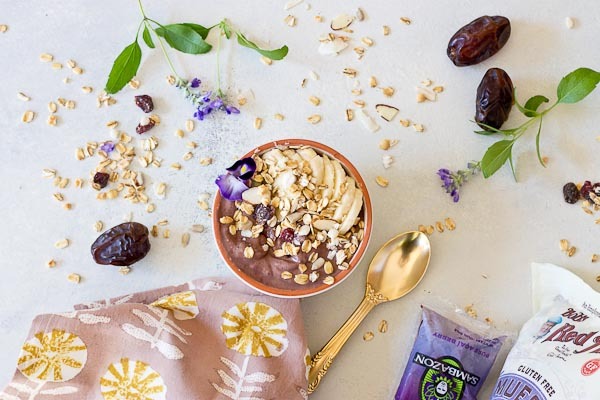 The creaminess factor was upped with plain kefir and peanut butter and topped with bananas (naturally) and gluten free muesli for irresistible crunch in every bite. Can we chat for a few? Babysitter’s are amazing. I’m having a total mommy boss win today because productivity is happening and my baby is at the park with his BFF down the road and the babysitter. This makes my type A personality happy. Babysitter’s Club…. now I have that song in my head. Girls from the 80’s/90’s know what TV series I’m talking about….say hello to the people that care. Anyways, this gets me all giddy because you know I stinking LOVE being a mom and it’s the privilege of my life and at the same time I freaking love this business… that I get to create delicious recipes and play with photography and video (new, new, new… if you’ve been following my insta stories). 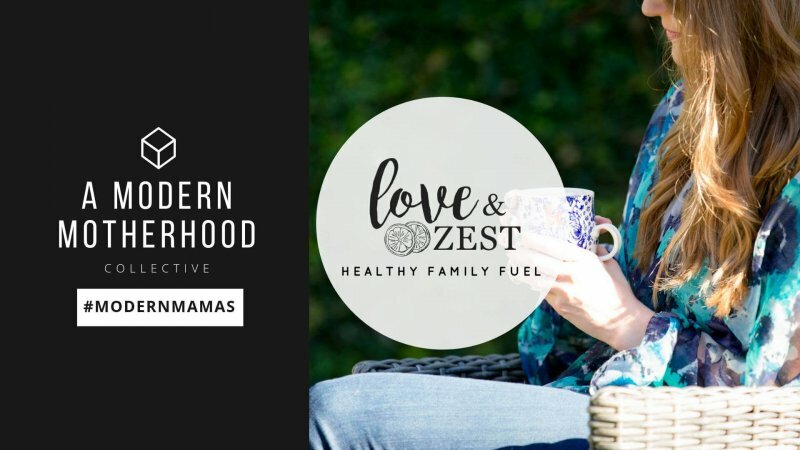 I always dreamed that when I became a mom that this blog would allow me to stay-at-home with my kiddos and it has, BUT (there’s always a but, right?) 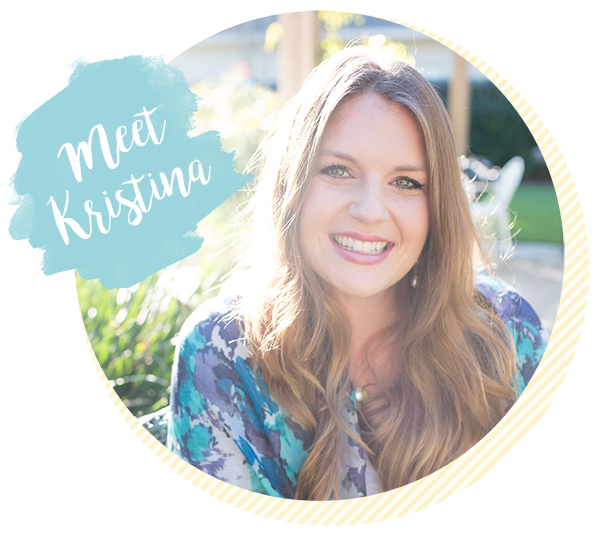 anyone in the blog world knows that running a blog business is a monster and takes LOTS OF TIME… meaning I need some extra hands in the kitchen, behind the screen and camera, and playing with the little guy. This year has been a big learning experience since going out on my own in January and running this thing full time while being a stay at home mom. One of the biggest lessons I’ve learned is that I simply cannot do it all on my own. I’m no super mom here. 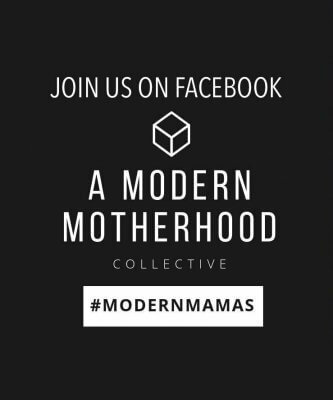 It takes a village to raise a child just like it takes a village to run a blog. I’ve had to learn how to invest in this business too with new equipment, new programs, hiring a virtual assistant, videographer, designer, developer, and a BABYSITTER… and the list continues to grow. There is so much stuff that goes on behind the scenes that I didn’t realize when I had this dream of staying at home with my little one years ago. If I could go back and send a little ole message to my younger self it would be to HUSTLE harder. I didn’t realize how much time and freedom I had working a 9-5 and blogging “on the side” before I had this sweet and precious and wild child. It blows my mind. Moms out there I know you can relate and get it. It’s crazy just thinking about, right? SO are you here for the recipe and less of the baby/business talk? We’ll let’s get down to it NOW. 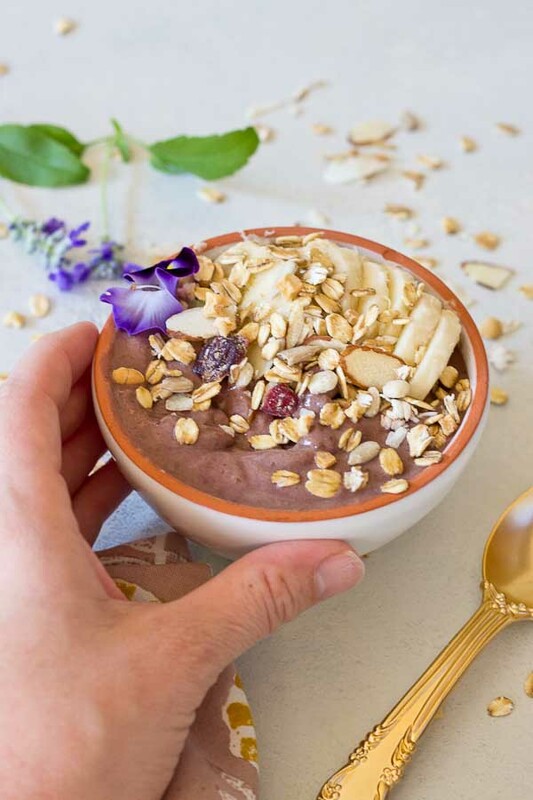 I’ve teamed up with Bob’s Red Mill and Sambazon to create this Banana Peanut Butter Breakfast Bowl for their #SuperFoodShowdown to create a recipe that’s tasty enough for a foodie and healthy enough for an athlete. Guys, I’m like so pumped to share this recipe with you! 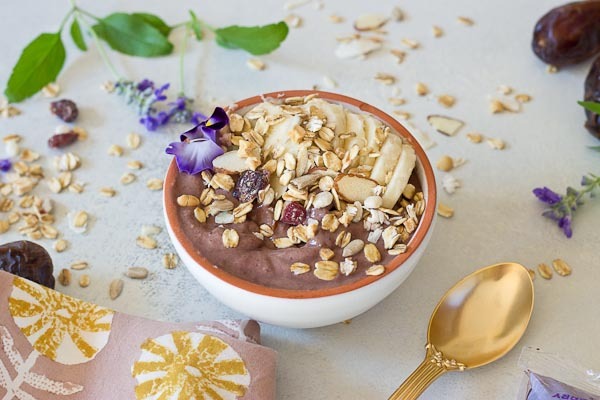 This Banana Peanut Butter Breakfast Bowl is seriously the best smoothie bowl I’ve ever created and you know how much I love smoothies if you follow this blog. 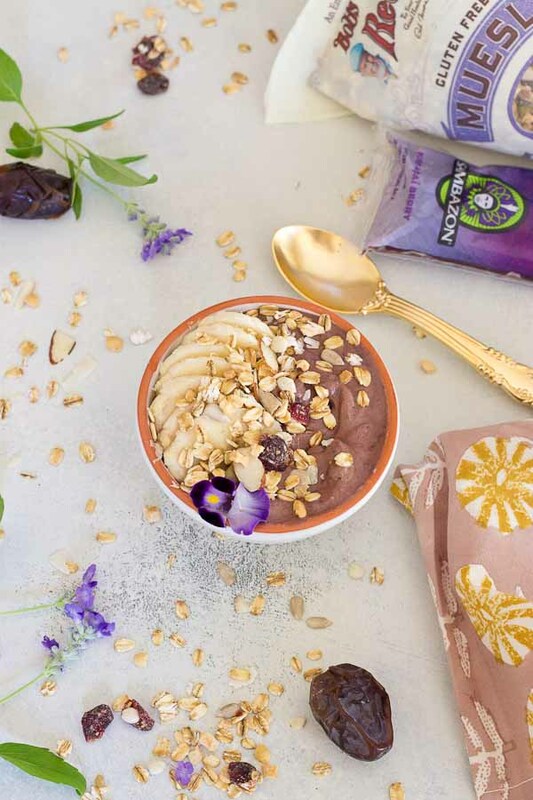 It’s naturally sweetened with medjool dates, bananas and power packed with antioxidants from Sambazon unsweetened acai. Creaminess factor was UPPPED with plain kefir + peanut butter. WINNING. 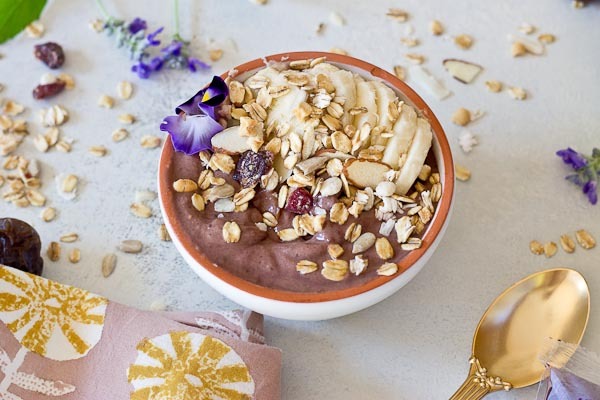 This Banana Peanut Butter Breakfast bowl is topped with bananas (naturally) and Bob’s Red Mill Gluten Free Museli for irresistible crunch in every bite <<– that stuff is amazing! Pick some up ASAP. I like to snack on it raw or in a bowl with almond milk too. A great night cap (speaking from experience here). Here’s the deal. 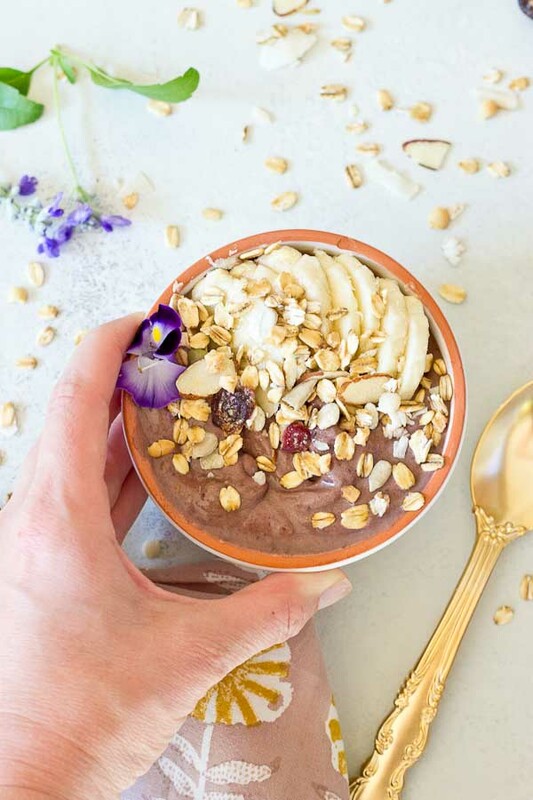 I need your help because I’d love to win this #SuperFoodShowdown contest… and all I need you to do is LIKE this Banana Peanut Butter Breakfast Bowl on Instagram! THANK YOU!! 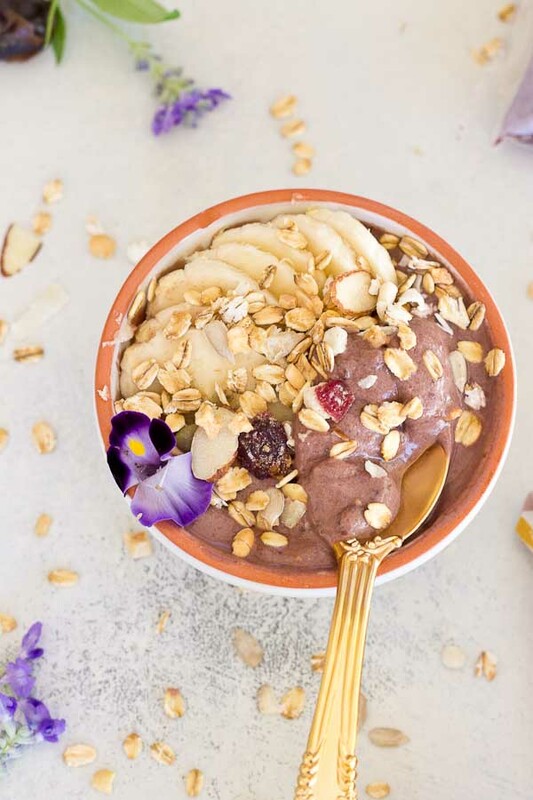 Place dates, acai, kefi, frozen banana, and peanut butter in high powered blender and process until smooth and creamy. Pour into bowl and top with banana slices and muesli. Spoon up all that goodness.